During the commissioning work, we discovered that one of the network connections on one of the digital signal processing boards was not working correctly. 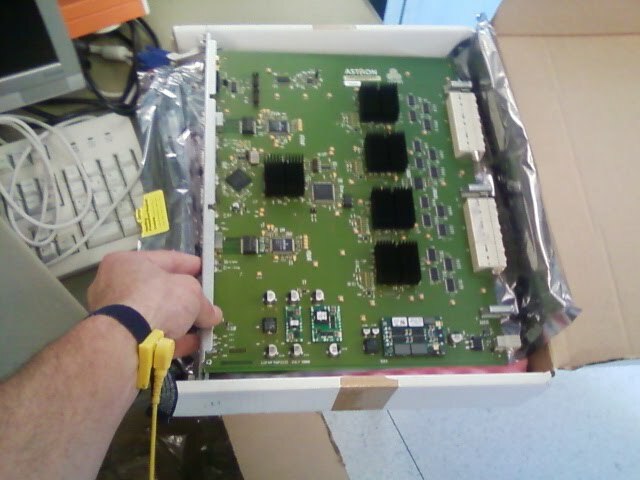 By exchange modules with others, we could determine that the fault was located in this particular board. As soon as we have completed the detective work, ASTRON were notified and a replacement board was sent out immediately. Caption: This new board has now arrived and was fitted and initialised. The photograph shows the board as it was being unpacked. The new component is now fully fitted and is working correctly.